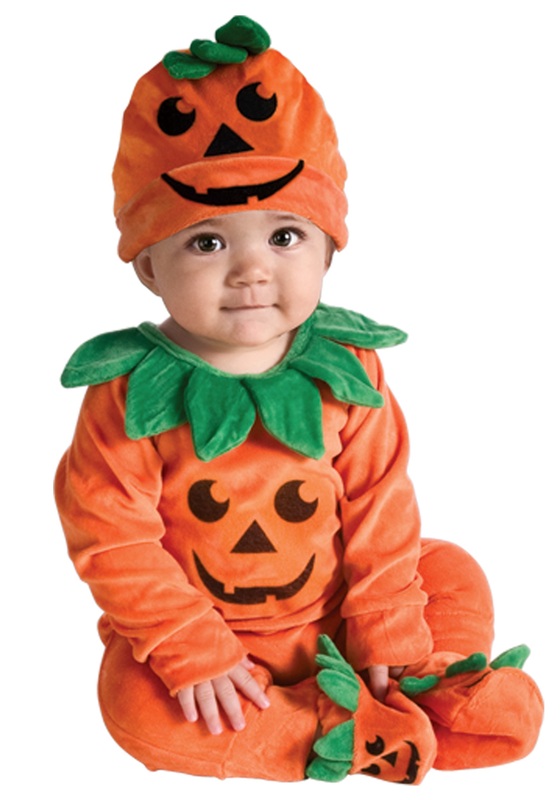 Orange romper has collar of green "leaves"
Pumpkins are the quintessential Halloween icon. Whenever you think of Halloween, the first thing likely to pop into your mind is an image of a perfectly orange pumpkin. Your child will be the cutest one in the preschool pumpkin patch in this Infant Li'l Pumpkin Onesie! It has convenient inseam snaps for easy diapering and a cute jack-o'-lantern face printed on the front. The orange romper also has a collar of green “leaves” for added detail. The hat and booties also have the printed jack-o-lantern face and the hat has green leaves sewn to the top for a look that is straight from the pumpkin patch! The booties have elastic at the ankles so that they stay in place all night long while also keeping your little one’s feet nice and toasty!